Let’s be honest: cucumbers aren’t the most charismatic veggie out there. They’re not a nutritional powerhouse like kale, or adorably diminutive like Brussels sprouts, but they compensate for their lack of exuberance by being so versatile. When cool cucumbers mix and mingle with sweet pineapple and kicky jalapeños, something delicious happens. Suddenly, the cucumber is sitting at the cool kids’ table. Mix everything in a medium bowl and allow flavors to meld about 10 minutes before eating. 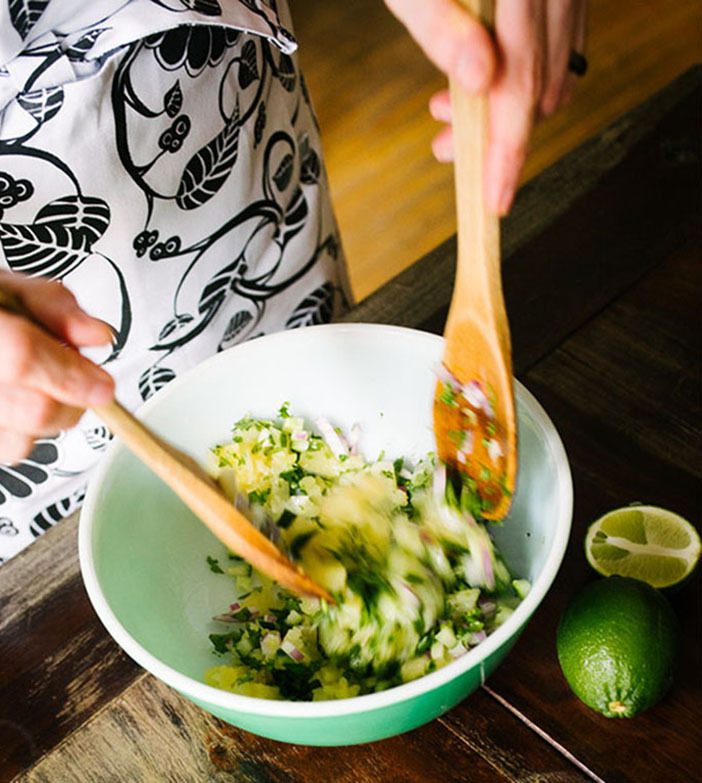 I make mango salsa often, don’t know why I’ve never thought to use pineapple. Loved the addition of cooling cucumber. We had this with your stovetop carnitas & some Mexican cauliflower rice. What a delicious meal! Such a good flavor pairing! I’m glad you liked it! I love how accessible your recipes are! I got home from vacation today and haven’t yet hit the store, but I think that I have what I need to pull this together- thanks so much for the great ideas! Do you have a recipe or suggestion on a seasoning blend I can sprinkle atop raw cucumber slices? I usually top it with salt and pepper, but that’s too bland. I love your Roasted Cabbage Roses which inspired me to ask about a spice blend topping for raw cucumbers. PS. I had all your books, but lost them to my ex wife in the divorce. Your books were the first thing I purchased (repurchased) after the divorce. Oooh, this is a fun question. My first recommendation is to go Middle Eastern and sprinkle with za’atar seasoning. It’s a blend of sumac, thyme, and sesame seeds. The sumac is tangy and the sesame seeds add a nice nuttiness. If you want to skip the sesame seeds, you could just go with plain sumac. Another option is Mexican influenced: squeeze some lime juice over the cucumbers and sprinkle with chili powder and a little salt. 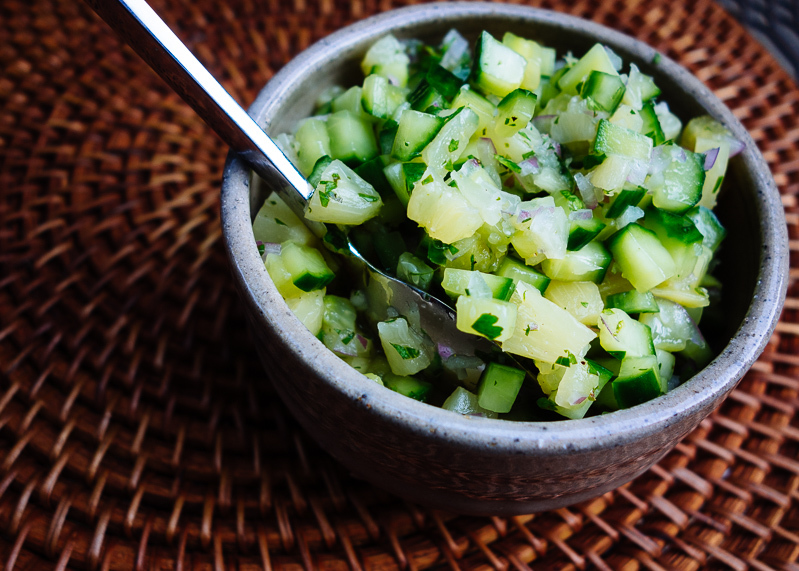 Finally, you could try a Turkish approach: squeeze lemon juice over the cucumbers and sprinkle with fresh or dried mint leaves and a little salt.